Add all dry ingredients to a medium bowl and combine well. Add oil and mix with a fork. Gradually add water to achieve your desired consistency. 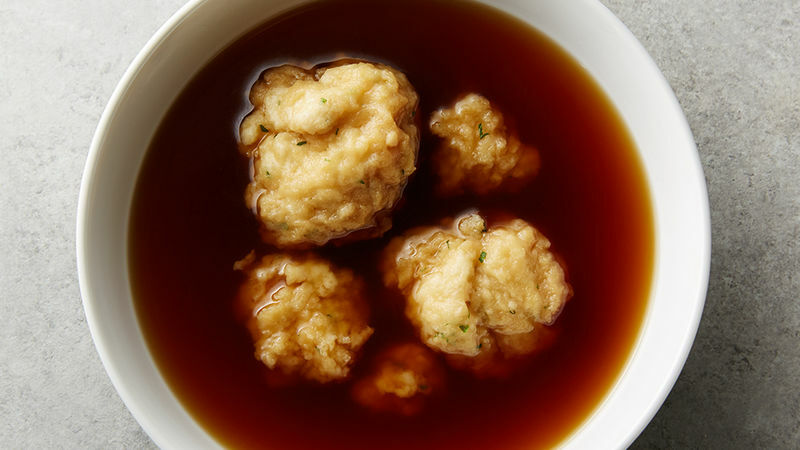 Bring broth to a boil and add dumplings by the spoonful. Cook 4 minutes or until cooked through in the center. For a unique look and added flavor, add chopped parsley to flour before making dumpling dough. The secret's out! Tender, pillowy dumplings may taste like they took eons to prepare but after making our drop dumplings from scratch, you'll know the truth. While most recipes for drop dumplings can take well over an hour to cook, this recipe only requires three steps and an hour of your time before you’ll have a savory, comforting bowl of dumpling bliss. Homemade drop dumplings are satisfying all on their own, but should you choose, there's plenty of room to play with your own tasty broth add-ins, like scallions and mushrooms. There's also room to play in our easy soup collections, so what are you waiting for?